The Morris County Municipal Utilities Authority, which provides drinking water to Morris County municipalities and oversees the County's garbage transfer stations and hazardous waste disposal facility, and recycling programs, celebrated environmental excellence during an award ceremony on May 12, 2017 at the Frelinghuysen Arboretum. Nancy Meade received the "Recycling is Fundamental" award. She is a teacher at Stony Brook School in Rockaway Township. Her fourth grade recycling club students accepted the "It's S'cool to Recycle" award. Ms. Meade created and is the advisor to the school's recycling club, which oversees recycling for the school. The club promotes recycling by collecting and weighting recyclables to see how much material they are keeping out of the landfill. Mary Ellen Potucek, on-site manager of the Robert Cole Senior Housing Complex of Chester Borough, was given the "Golden Age Recycler" award for the exceptional recycling program at this 38 unit affordable housing community. The MCMUA's curbside collection crew has nothing but good things to say about her staff and the way they prepare recyclables. Last fall, Arthur J. Gallagher & Co., located in Whippany, cleaned up over a ton of litter from the banks of the Whippany River, the lawns of Central Park, and the trails of Patriots Path. Employees joined members of the Hanover DPW, Fire and Police Departments, and the Whippany River Watershed Action Committee by donning hip waders and jumping into rowboats to remove trash from hard to reach areas. Because of their hard work, the company received an award entitled "Insuring a Better Tomorrow by Caring about Today." Rob Grow, the owner of Potbelly's Riverside Café, located on Main St. in Rockaway Borough, has conducted spring and fall cleanups for the past 10 years and has relied on volunteers to help clean the Rockaway River and its banks. The cleanup usually takes place between the falls behind the firehouse and the falls at Jackson Avenue, but Grow will go farther afield depending on the amount of litter, the number of volunteers, and the weather conditions. Because of his decade of environmental awareness, the MCMUA honored him with the "Rockaway River Clean Water Stewardship" Award. Rosemary Schmidt was quietly picking up trash in her neighborhood when she was discovered by members of the MCMUA. 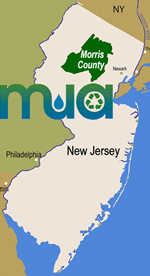 "What a wonderful surprise," said Liz Sweedy, the Morris County Clean Communities Coordinator. She continued, "Rosemary made my day and my year!" Without any fanfare, this resident of Randolph goes out regularly and tackles litter along a busy street near her home. In her honor, the MCMUA presented her with the "Leading by Example" Award. Earth Friendly Products received the "Recycling Naturally" Award. This Parsippany company believes that what's on the inside counts and they have spent nearly 50 years creating and perfecting thoughtfully sourced cleaners that work great and are safer for people and the planet. Formulated with pure, thoughtful science and manufactured using zero-waste guidelines, products are made in facilities powered by renewable energy where recycling is a priority. The Woman's Club of Morristown was honored with the "Supporting Sustainability" Award for their fourth annual Bra Drive. The club collects new and lightly used bras in all sizes and styles. The garments are distributed to Howard's Mission and Dress for Success Morris County. Women are provided with professional attire and confidence to help them secure employment. Bras that cannot be used are sent to The Bra Recyclers, an Arizona-based textile recycling company whose mission is to reduce the amount of textiles going to landfills. Larry Gindoff, Acting Executive Director of the Morris County Municipal Utilities Authority, thanked all of the award recipients for their outstanding environment work. He announced that the winners of the Slam Dunk the Junk poster contest were Shreya Seripalli, Copeland Middle School; Priya Patel and Lizzmarie Perez, Morris Hills High School; Amanda Giglio, Morris Knolls High School; Sheryl Peng, Mount Arlington Public School; Mike Capobianco, Pequannock Township High School; and Carrie Schofield, Riverdale Public School.